Card Text Action: Fully heal an Ancient Bear. If there are no Ancient Bears in play, search your deck and discard pile and put each Ancient Bear from them into your hand. If you do, shuffle your discard pile into your deck. If the opponent has Ancient Bears in play, does this affect how Bear Flute operates? Yes. 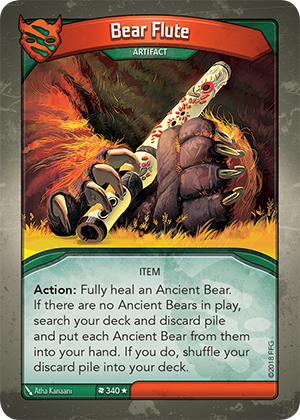 Until all Ancient Bears (including the opponent’s) have left play, the Bear Flute can only be used to heal Ancient Bears.